Frankie, meanwhile, has to care for their two small children, run the house and make sure there is enough to eat in spite of ever increasing shortages and ever more severe rationing. She must also keep their farm going. She works with recalcitrant men who don’t believe women could or should be in charge. They are also (with good reason) afraid that if they teach her how to do their jobs, she will take over and they will be sacked. But the farm belongs to Frankie and she is tough and determined. She gradually masters most farming skills, discovers that they are not as difficult as her workers made them seem and, one after another, the men she employs either leave, or learn to live with her as boss. As early as February 1941, Frankie starts to write her first book about her ‘experiences and adventures as a farmer’. By May, it is finished, Faber makes an offer, and in October it is published. The book has what Frankie calls a ‘prestige success’, with good reviews in farming and literary papers. The hard labour never stops. In 1942 Frankie decides to sack the bailiff and run the farm herself. ‘Oh boy, am I excited!’ she writes. During the following years the farm flourishes or fails, depending on the weather, and Frankie’s letters swing between jubilation and misery. Occasionally she escapes to London and sees her friends, mentioning many a well-known name; as the daughter of Freddie Lonsdale, a successful playwright, Frankie had moved in ‘high society’. 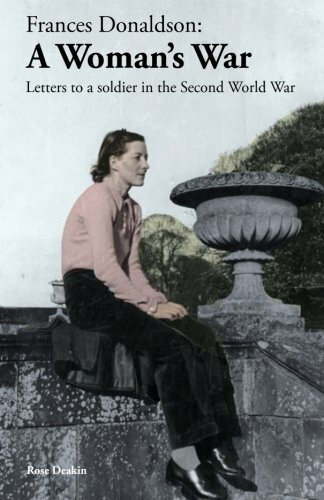 As a contemporary account of agriculture during World War II, and of women and children’s lives during the long absence of their men, these letters, spontaneous, unself-conscious and candid, are fascinating. They also amount to a ‘warts and all’ portrait of someone who was clearly a remarkable woman. Frances Donaldson later became a well-known biographer who won prizes for books on such varied subjects as P.G.Wodehouse, Edward VIII and Evelyn Waugh; she wrote about events such as The Marconi Scandal, and several autobiographical volumes. Jack became Lord Donaldson, an influential figure in the Labour party. It is their daughter who has edited these letters, a labour of filial love. It was well worth the effort.